(Oct. 17, 2018) – The Portland Bureau of Transportation and Portland Police Bureau will conduct a crosswalk safety education and enforcement action on Wednesday, Oct. 24, at the marked crossing on NE Sandy Boulevard at NE 85th Avenue from noon to 1:30 p.m. to raise awareness of pedestrian safety and Oregon traffic laws. PBOT also reminds Portlanders to use extra caution while traveling on city streets and sidewalks on Halloween. Under Oregon law, EVERY intersection is a legal crosswalk, whether it is marked or unmarked. People driving must stop and stay stopped for people walking when the pedestrian is in the travel lane or the adjacent lane. Children all across Portland will take to the streets to trick-or-treat for Halloween on Wednesday, Oct. 31. The National Highway Traffic Safety Administration reports that Halloween is consistently one of the top three days for pedestrian injuries and fatalities. The Centers for Disease Control and Prevention estimates that children are four times more likely to be struck by a motor vehicle on Halloween than any other day of the year. Because excited trick-or-treaters often forget about safety, people driving and parents accompanying children must be even more alert. Everyone should focus on being visible and watching out for other travelers. Add lights and reflectors to your child's costume - it's a fun and easy way to help keep children safe as they trick or treat. People driving can do their part by driving at or below the posted speed, continuously scanning the environment looking for people walking and bicycling, and being ready to stop as needed. People walking and bicycling are encouraged to be more visible by wearing retro-reflective clothing, using a flashlight or blinking strobe, and investing in bright and contrasting outerwear. Education and enforcement actions such as the Oct. 24 event are a key part of the City of Portland’s citywide effort to reach its Vision Zero goal of eliminating traffic fatalities and serious injuries. Sandy Boulevard is one of Portland’s 30 designated high crash network streets. This location has bus stops on both sides of the street and is within close proximity to businesses, restaurants, a senior living facility and The Grotto, a prominent destination for 300,000 visitors annually. 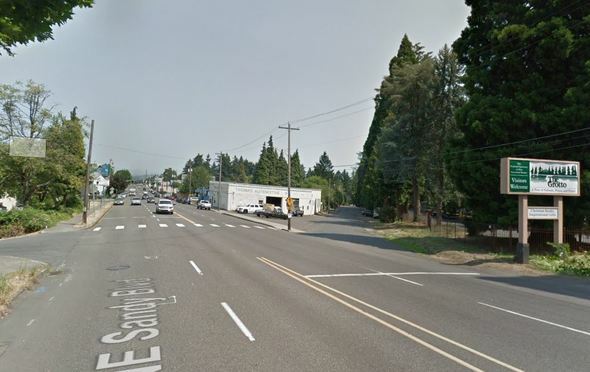 SE/NE Sandy Boulevard had two traffic fatalities (one pedestrian and one person in a motor vehicle), 30 serious injuries and 75 moderate and minor injuries in 2012-16, the latest five-year period for which complete crash data is available. Since Jan. 1, 2017, there have been four traffic fatalities on SE/NE Sandy Blvd, including three people walking and one person driving. Education and enforcement actions such as the Oct. 24 event are a key part of the City of Portland’s citywide effort to reach its Vision Zero goal of eliminating traffic fatalities and serious injuries. Each crosswalk enforcement action involves a designated person walking at a marked or unmarked crosswalk while police monitor how people driving, bicycling and walking adhere to traffic safety laws. Drivers who fail to stop for pedestrians in the crosswalk and pedestrians who fail to follow Oregon traffic laws may be issued a warning or citation. A PBOT staff member will serve as the designated pedestrian crossing the street during Wednesday’s action. Crosswalk education and enforcement actions are an effective way to communicate traffic laws to people driving and walking. The transportation and police bureaus do education and enforcement actions in response to requests by community members, city traffic safety engineers, and Portland Police to educate the general public on the rules at marked and unmarked crossings. Learn more about rights and responsibilities for crossing streets in Oregon (in English;Espanol); and view the results of previous actions. Portland is committed to ending traffic violence in our communities. Through the Vision Zero program, the City of Portland and our partners are working to eliminate deaths and serious injuries on our streets by 2025. For more information about Vision Zero, or to request a community briefing or enforcement action in your area, email VisionZero@portlandoregon.gov or call Matt Ferris-Smith, program specialist, at 503-823-5831.